It is truly amazing what you can do with a couple of cans of beans. Here they are transformed into a pretty classy dish (if you choose the right plate to serve it on, it even looks rather painterly). Bitter leaves, sweet onions, earthy beans, the different components work very well together. For the bean purée, heat the regular olive oil in a saucepan and gently cook the onion until it is soft but not coloured. Add the garlic, the beans, stock or water and seasoning. Cook over a medium heat for about four minutes. Process the beans and their cooking liquid in a blender or food processor with the extra virgin oil and lemon juice. Taste and adjust the seasoning. You can set the purée aside to reheat later, or serve it at room temperature. Mix the regular olive oil, balsamic and seasoning together in a dish and put the onions and radicchio in it. Gently turn over to coat then leave for about 10 minutes. Heat a griddle pan until really hot and cook the onions quickly until well coloured on both sides. Reduce the heat to low and let the onions cook until they are soft, turning frequently. Meanwhile, spoon the bean purée into a serving dish, reheating it gently first if you want to. Increase the heat under the griddle pan and add the radicchio. Let it colour on each side – this will happen very quickly – and wilt. 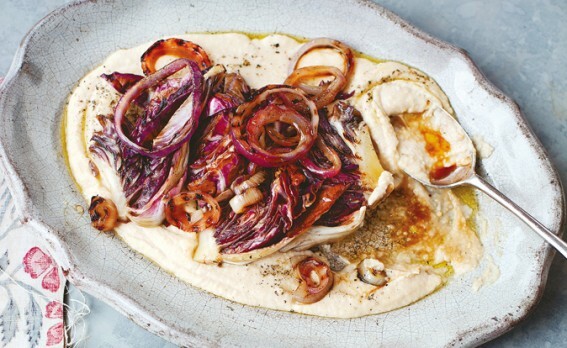 Put the radicchio and onions on top of the bean purée. Season and serve with a little extra virgin oil drizzled over the top.